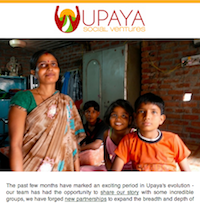 Upaya is proud to announce that Bulbul Gupta has joined the organization’s Board of Directors. As the Head of Market-Based Approaches at the Clinton Global Initiative, Bulbul works with corporations, non-profits, government, private citizens, and family foundations that rely on the power of markets and market mechanisms to address social and environmental challenges. Bulbul is based in New York City. For more on Bulbul, please visit www.upayasv.org/board. The Upaya Social Ventures team attended the 2013 Clinton Global Initiative in New York City on September 23rd - 26th, joining an esteemed group of organizations who have made far-reaching Commitments to Action in order to resolve the world's most pressing problems. The Annual Meeting's theme was "Mobilizing for Impact," and strongly encouraged the forming of partnerships and action plans in order to meet members' ambitious goals. Executive Director Sachi Shenoy, represented Upaya at the meeting and had the opportunity to make a public Commitment to Action: to create dignified jobs for the ultra poor, primarily women, in India by October 2014 by doubling the number of enterprise partners in Upaya's LiftUP Project network. "The meeting was a fantastic opportunity to meet and collaborate with hundreds of other organizations -- both large and small -- who are all passionate about global social impact," said Shenoy. "Over the course of four days, we met influential thought leaders and other social entrepreneurs, and forged connections over a variety of working sessions and social events. The meeting left us energized, validated, and excited by all the potential partnerships that lie ahead!" A particular highlight was the "Impact Investing: The Second Act" session. The room was filled with many prominent impact investors and entrepreneurs who engaged in an extremely frank discussion about both the opportunities and very real challenges that still face social start-ups in the so-called Pioneer Gap. "With so many leaders on both sides in the same room, it was a good reminder for me that Upaya is not alone in seeing the growth of Small and Growing Businesses (SGBs) as a transformative force in the fight against extreme poverty," said Shenoy, "but it also reinforced that we have a long way to go in realizing our goal."